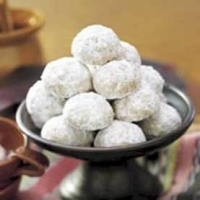 Traditional Christmas cookie sometimes called Mexican Wedding Cakes, Mexican Wedding Cookies, or Russian Teacakes. Preheat oven to 400 degrees. Mix butter, 1/2 cup powdered sugar, and the vanilla extract. Stir in the flour, nuts, and salt until the dough holds together. Shape into small 1-inch balls. Place about 1 inch apart on an ungreased cookie sheet. Bake 10-12 minutes, or until set but not brown. Roll in powdered sugar while warm; cool. Roll in powdered sugar again. When I decorate for Christmas and put out the Christmas cookie jar these are the first cookies I want to make and always make them as soon as we're done decorating. We just made these on Saturday and they're almost gone! Like teatimin's recipes? Never miss an upload!